In the early afternoon I took a ride down to Island Heights, to the Ocean County Artists' Guild. Today was the dropping off day for the shows that open this coming weekend. 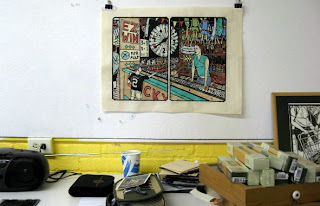 I found myself in a little room on the main level where work for the Printmakers' Invitational was being collected. I filled out a bunch of paperwork- loan agreement, label information, etc. 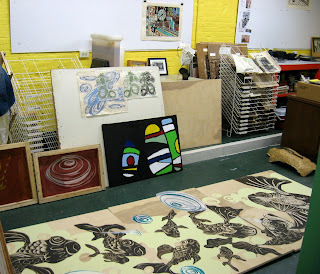 The room that is to hold the print show is much too small to hold the three works requested from each artist. The plan is to put two from each artist in the first gallery, and the remaining work in the larger gallery that also includes the member show that opens the same day. The opening reception will be Sunday, February 1 from 1 to 4 pm, over well before the game begins. 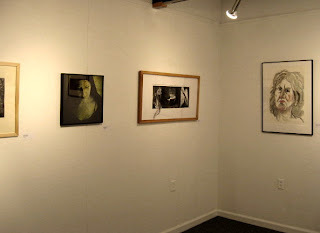 The show will remain on display through the month of February, with regular gallery hours Tuesday to Sunday, 1 to 4 pm. Having taken care of my business at OCAG, I technically had enough time to go home and then get back down to the Toms River area for my evening class, but that would be a waste of time and fuel, so I just went right to school and used some of that time to do some library research toward what will likely be the next print that I work on. I hope to have something to post regarding that within the next week. Something strange today- a Saturday with nothing in particular that I have to do. No work to deliver, no art receptions, no holiday related activities, nothing happening in Belmar. And a relatively nice day, too. So I went to the Studio to finish up that 2nd okawara proof I've been working on for the last week. Put in the last few colors, touched up a few things done earlier. I think it's pretty much done. All the colors are the same as the first one, though if you put them side by side (which I haven't, as the other one is home, framed for an upcoming show), you might notice some slight differences in intensity of some colors from one copy to the next, but the same could be said for most of my color pieces. Ideally I'll sell one or both of these eventually, necessitating printing and coloring additional copies. But since that's not likely to happen soon, I need to start thinking now about the next print. At this point I'm assuming the next one will be another from this boardwalk series- I just have to decide which one to tackle next. On my way to work I stopped by the local glass place to order another piece of plexi, to frame the first proof of the first boardwalk print. The receptionist took the order, but mentioned that they might be low on the type I need, and said she'd call me to let me know. 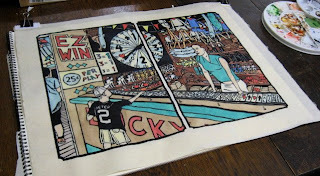 After work today I swung by the Studio to continue coloring the second proof of the first boardwalk print. Added the reds, browns, some blues, and some detail colors. Probably another hour would have been enough to finish the whole thing, but I was getting hungry and there is no need to finish it today. Back home, no message on my phone machine. This may mean that there is no problem with my plexiglass order, but tomorrow I'll stop by and verify it. Today was the first day of classes in the spring 2009 semester. Not a bad day- no traffic troubles, was able to find good parking, the copy machine held up long enough for me to make all my copies. The class itself went fine. When I got back home after work I found a special treat- a huge pile of boxes on my front steps. 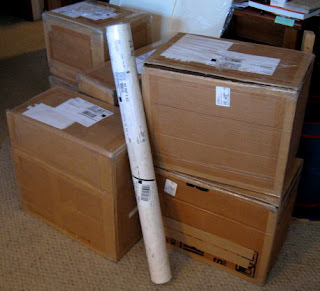 Not a surprise, since I was expecting delivery of my artwork back from the Iowa show today. The packages looked a little more scuffed and banged up than when I sent them out in early November, but inside my solid construction kept everything safe. Glad to have them back, since one or two of these pieces will be going out to another show next week. Of course, I now have to find a place to store all this stuff, but I'll deal with that later. When I awoke this morning, I found the largest measurable snow of the year so far- almost an inch. Took about a minute to clear most of it away and some brief morning sun took care of the rest. While nature was taking its course, I cut a mat for the boardwalk print, sized to fit a frame I bought at Pearl the week before last. By afternoon more snow was falling, just flurries this time, nothing to keep me in the house, and I went to the Studio to continue coloring the 2nd copy of the print. I got as far as the above photo shows. Another visit or two should take care of it. 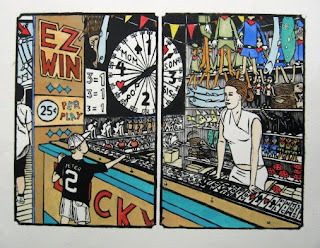 Before I move on to the next print in the Floating World series, I figure I should go ahead and color the other okawara proof I have of the wheel game diptych. And it's good to take care of this before I frame the one that's finished and send it off to a show for a month. Shouldn't take long, since I've been through this a couple of times and know exactly what I want. Even have most of the colors already mixed. So I put in a little time this afternoon coloring. Wasn't able to take a photo, but where I left off today was pretty much like what you see here. I should have it done by the end of the week. 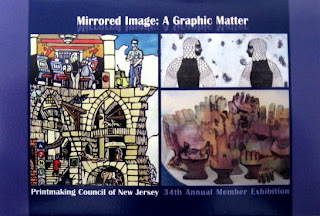 Today was the opening reception at PCNJ for Mirrored Image: A Graphic Matter, the 34th Annual Members Exhibition. At the same time, it was the opening for the 3 person show of award winners from last year's members show, so as people arrived they first saw that show in the Library Gallery. 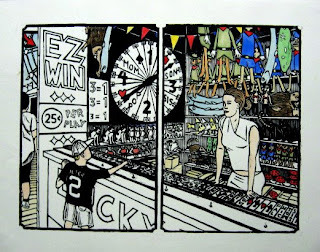 I had on display 4 supermarket prints (top photo), some more recent than others, but all had in common that they hadn't been shown at the Printmaking Council before. 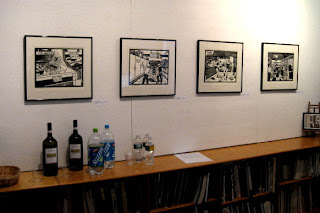 My work was joined in that room by a selection of linocuts from Mark Estes (who was a student in one of my PCNJ workshops) and the etchings of Claire Simon. The bigger show was in the Main Gallery, the members show. My contribution can be seen in the second photo. It got a lot of attention and I ended up spending much of the 3 hours explaining the various parts and the stories behind them. The supermarket prints had a lot of fans as well. A smaller percentage of artists in the show/PCNJ members came than usual, but those who were there brought a lot of family with them, so it ended up being a pretty good crowd. 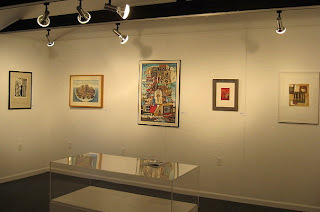 Both shows remain on display during regular gallery hours through March 7, 2009. Off from work today, not ready to start a new print, all caught up on my school preparations. 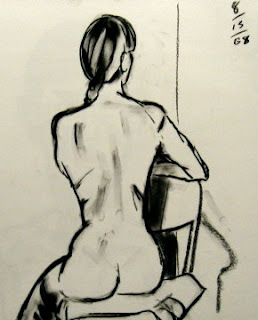 Seemed like a good day to go to Belmar and put in a shift of gallery sitting for the figure show we have up right now. Between the construction vehicles and barely out of single digit temperatures, I wasn't expecting too many visitors, and I was proved right. Not that I was alone- we had a number of people around taking care of BAC business, and I was even involved with some of that. I had plenty of time to look at the work in the show, and took a few photos- a better shot of my two pieces (top), and groupings by Joan Wallace (watercolors) and Celeste Gober (conte crayon). 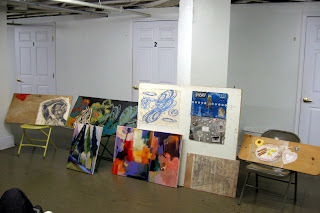 We had 6 participants in the critique this time around. Molly and I of course- I showed the new boardwalk print and Molly had a bunch of stuff, the commissioned table (with fish, bottom of the photo) being the focus of the discussion. Tim was back after a few months missed, bringing his latest abstraction. Guido also returned, bringing an experiment in still life via Morandi (not shown as he arrived after this photo was taken). And we had two new people, both artists who work out of SICA in Long Branch, both bringing sculptures. Adam works with man made materials collected from work sites on his day job. His piece is the small assemblage on a table, just underneath my print (click the photo to enlarge), made from some carved asphalt, reinforcing wire, and a "bag" made from residue of latex paint, all holding together in balance. Jane brought the piece on the ground (it's intended to stand up when finished) on the far right, an early stage in the first of new series of sculptures made from body castings and a variety of materials. Both seemed excited by the comments they got on their pieces, so perhaps we'll see more from them in the future. The group now meets on the first Monday of every month, unless otherwise noted here. Our next meeting will be February 2, from 7 to 9 pm. After work on Monday I went straight to the Studio to try to finish the proof in time for the evening's critique. I put in blues (on prizes and clothing), greens (prizes), browns (prizes), and a few details here and there. The above is the result. I like it. There may be a better color combination out there, but I'm happy enough with this one. I'll use this as a guide to color the other proof on okawara, then frame this for an appearance in an upcoming show. 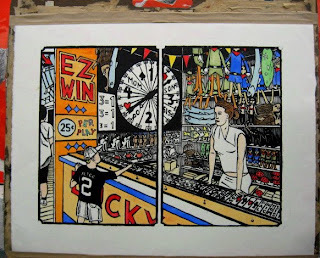 The official title that I intend to use for this print is The Floating World: Wheel Game. 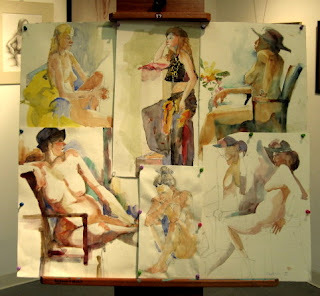 By 3 pm there was still no sign of snow, so I went on to Belmar for the opening reception for the Figuratively Speaking show- work from participants in the figure drawing workshops held at the Boatworks. A few dozen people had the same idea, and were enjoying the art, refreshments, and some classic 1950's science fiction movies playing in the back room. My pieces can be seen in the center of the above photo. You can see my drawings better here. Or click here to see more photos from the exhibition. The show remains on display through January 31. Late last night the weather reports started pushing back the start of snow to late in the day on Saturday, and by early afternoon nothing had started, so there was nothing to keep me from putting in a little more time in the Studio. I only had about an hour or so, and today I concentrated on reds- a dull red for the big lettering on the signs, and a brighter red in spots all throughout both panels of the print. What's left is mostly blues, greens, and browns, and some little details yet to be determined, based on how everything comes together. I should be able to finish it before Monday's meeting of the critique group. The forecasts for tomorrow are for the first measurable snow of the season around here (and much more up north), some time during the afternoon. If it arrives early enough, it could keep me from getting into the Studio tomorrow. Since I want to show the finished print at Monday's group, I decided to put in a some coloring on my way home from my errands in Central Jersey. Today I added in some cool colors. 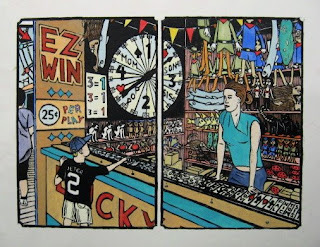 I put the light blue color in parts of the sky (which also includes a fade to yellow, a common device in classic Japanese prints), parts of the wheel and game board, the 25 cent sign, and some prizes. I mixed up some of the light turquoise color and put it in all the places it appeared in the first proof. A little light purple wash cooled and darkened the boardwalk. I was only there for about an hour, but when you have a plan to follow, things can go quickly. Since I'm still waiting on the return of all the artwork that went to Iowa, I had to open up the late night frame shop again last night, just long enough to swap three supermarket prints for three others. This morning I took care of a few last minute tasks (adding wires to two frames, printing labels for the backs) and then set out for North Branch around noon. No real traffic, so I got up to the Printmaking Council by 1:30. Brought in my piece for the juried show, and the four for my part of the 3 person show. The previous show was still up, so I was able to see that before I left. The postcard above is for the juried show, and is the 2nd card for an early 2009 group show that includes my artwork on the front. The exhibitions open on Saturday, January 17, with a reception from 1 to 4 pm, and remain open through March 7, 2009. On my way back from PCNJ, I diverted to Woodbridge, where I stopped Pearl and picked up some frame parts, matboards, and foamcore, mostly to replenish a lot of the supplies I've used in recent months preparing for various exhibitions. From there, back onto the Parkway and down to the Studio. Having completed the first round of color experiments on the new print, it's time to begin coloring one for real. This time I'm working with one of my okawara proofs. 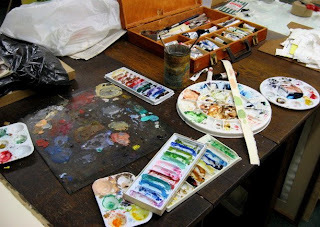 The first colored proof was on Rives Heavyweight, which is similar to a watercolor paper and behaves accordingly when it comes to using watercolors. Japanese papers are very different- different fibers and textures, plus much much thinner, sometimes almost transparent. Very easy to hand rub, though you do have to be careful not to tear the sheet. It also can work with a brush, for ink or watercolor, but it takes the paint in a much different way than heavier western papers. For example, too much water in the mix and sometimes the color soaks through and spreads to unintended areas. Whatever kind of paper, I usually start with warm and light colors, so that's what I did today. I put in the pale yellow color on the wheel, signs, and other spots. Looked pretty much as it did on the earlier proof. Next I mixed up a fresh batch of the yellow-brown color for the counter and applied it, but in the light wash I was using it also ended up a kind of pale yellow. After it dried I put over it a light wash of mummy, which brought it back toward a pale yellow-brown. Same color for the cardboard boxes behind the counter and bits of the prizes, and a slightly darker version for the boardwalk. I also put in some skin tones and some bright yellow spots. The last thing for the day was creating an orange-red color that I used to color all the shelves. 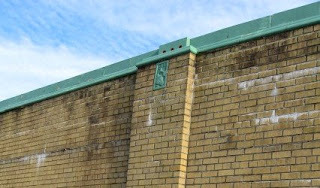 The results can be seen above. Next time I start putting in some of the cool and dark colors. No, we're not leaving the basement of the Jersey Shore Arts Center in Ocean Grove, NJ. Our meeting day is moving. Beginning in February, the critique/discussion group will be meeting on the first Monday of every month, from 7 to 9 pm. But even before then, we will have our next meeting on Monday, January 12th at 7 pm. 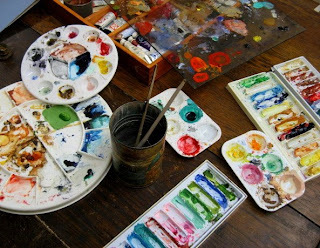 The group is open to all artists in any medium, style, or subject. Just bring a piece or two and be prepared to participate in the lively and professional discussion. Spent a few days considering what I had done so far and where to go from there, then went into the Studio this afternoon for a short time to put those ideas down on paper. I took the turquoise color and put it on the game attendant's blouse, setting up a rhythm with the other pieces of that color in the right side panel, as well as helping her separate from the background. I used some indigo on her skirt, the kid's hat, and the shirt on the boardwalk pedestrian. 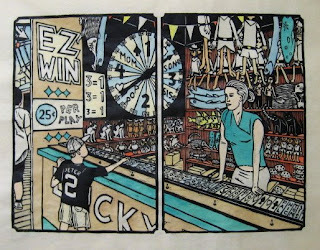 A wash of pale yellow went onto the kid's shorts, the prize conversion sign, and half the spaces on the wheel, where they alternated with the pale blue wash seen in the sky and other places. Both colors also now appear on the game space board, likely to be rearranged in the next proof. I added various color to the last few prizes. I considered a number of options for the color of the shelves. I tried one with an orange, but the rest were done with a pale deep red wash. A few other details were filled in, and that pretty much completes this first color test proof. The final version won't look exactly like this. Some of the above colors will be a little paler in the next one, some will be darker, or more bold, or different shades. Now that I have a general idea what I'm doing, I can build it up the proper way, get something a little better balanced. But that will wait for another day. 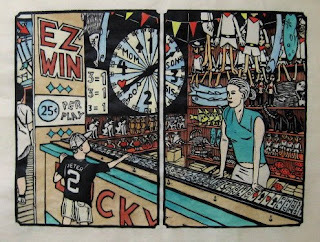 Last night at home, still thinking about how I want to deal with the colors in the new print, when I happen to glance at a section of a local paper sitting on a table. 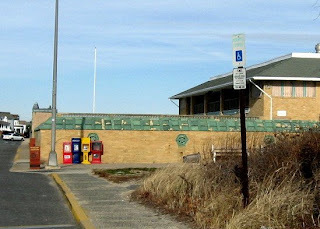 The article was about updates on renovations to one of the pavilions along the boardwalk in Spring Lake. There's one at each end of the beach (1st photo south, 2nd photo north), each with a pool (traditionally salt water), lockers, restrooms, concessions, etc. Never been inside either one, but I've driven or walked past the outsides of them many times. Something I've always liked about the design and the colors: the yellow-brown brick coupled with the blue-green trim, all with the weathered look of age and exposure to the elements. When I saw that photo, it suddenly occurred to me that this may be the solution to my color problems. 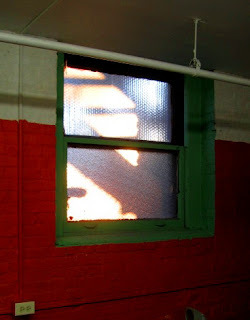 I swung past the pavilions on my way up to the Studio, to take those photos and remind myself of the exact colors. I mixed up the brick color, essentially the stone base color I used all over the tower print- buff titanium with burgundy yellow ochre. I put that over all the orange, and over the naples yellow parts of the counter. The turquoise color was a combination of amazonite genuine, phthalo green, and white. I put that over all the blue in both sections. I also toned down the red by laying over it a wash of light red (essentially rust), and washed a little off white over the yellow parts of the signs. I don't know if this is the final solution, but it's much better. Scroll down to yesterday's post and you'll see what I mean. Maybe not the typical boardwalk color scheme, but it will work better for the composition of the print. In the early afternoon I dropped off those framed drawings at the Boatworks. From there I continued up to the Studio to get back to coloring my new print. As I had planned, I went with mostly warm colors- most of the front counter is Naples yellow, with the vertical wall mostly a mix of cadmium orange and quinacridone burnt siena, and some red, blue, and other assorted colors for lettering and designs. When it got to this point I spent a bunch of time looking at it and decided that I did not like it. That orange color especially. It's not a bad color, and I like how the whole wall works, but it's just too bright to go along with the rest of the image. Either I have to get rid of it, or I have to put a lot more of the orange everywhere else to balance it, and I don't want to do that. As I was pondering all this Molly came by to do a little of her own work and so we could have a little celebration of the 3rd anniversary of our founding of this shared space. She had a whole bunch of suggestions for the color issues, starting with getting rid of that orange. Her main point was that the orange panel draws too much attention away from everything else, including the prizes that she sees as the focus of the image. I don't know that I agree with the last part of that- I think of the prizes as contributions to the overall composition first, and as details to be explored later. 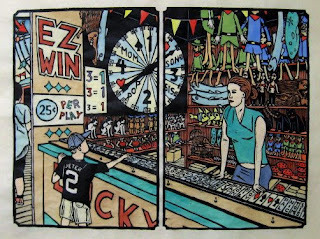 In addition, my goal was that each individual panel also works independently, so there has to be something to establish interest in the left panel, where there aren't a lot of prizes. Probably the wheel, which is strongly graphic to begin with. But no one will be noticing the wheel or the prizes or anything else until I deal with that orange wall. 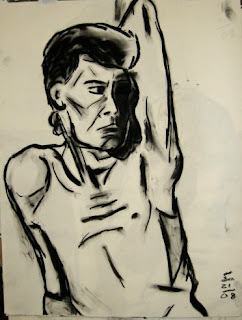 For the figure show I'll be providing charcoal drawings done during the BAC life drawing sessions, which I believe will be the first time I've exhibited drawings since the 80's. Although we were told we could just tack them to the wall, I'd rather frame mine. I was willing to do this because I had been given a bunch of large wood frames by my landlord at the Studio, perfect for this purpose. No glass, but each is matted and mounted, a much nicer presentation than push pins into the wall. I decided to show two drawings, the ones seen above. It may just be a coincidence, but of all the sessions I attended, these were the two models who I knew previously, having employed them multiple times in my college figure class. This was the first time I drew them, but I wonder if all the time I spent advising students on their drawings served as a kind of practice. Another day off around the holidays today. In the early afternoon I set out, stopping first downtown to mail out the first batch of Christmas cards (replying to all the people who've sent them to me so far) and picking up some picture hanging wire at the local hardware store. I have to bring artwork to some shows over the next week and I was out of wire for the new frames. 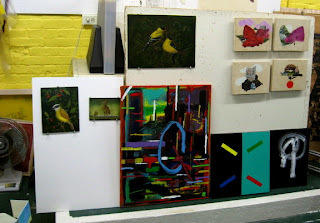 A few more errands and I was up at the Studio. Demolition continues out back, which resulted in the photo of the window above, with the silhouette of the back fire escape lit by the setting sun. Such a thing was not possible when the annex was still standing. 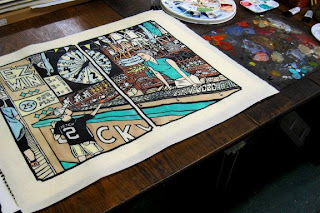 Today's work was starting the coloring of the new print. I taped down the blurred proof, then started adding color. I'm not copying from an existing booth, so I didn't come in with a specific color plan. Without a general overall plan in mind, I decided to start with local color of specific objects. For example, the prizes are based on specific items, particular animals or cartoon characters, so I put those colors in. I used some of those same colors in other places- I may try to keep a limited palette to bring in one of the elements of those Japanese color block prints. Those prizes that I didn't do were because I need to check my original reference sources. I didn't do the architecture yet, but I'm thinking that it will probably be mostly warm colors for the counter and sign and cool colors for the shelves, with a mixture of colors for the lettering and other details. I'll figure out the clothing after that. Once I have this one done, I can see what works and what doesn't, and make changes on the first good proof.